On June 9th 2018, we will witness the rematch of Leo Santa Cruz (34-1-1, 19 KO’s) and Abner Mares (34-1-2, 15 KO’s). As in their first fight, Santa Cruz VS Mares 2 will take place at the Staples Center in Los Angeles California, and will be brought to you by Premier Boxing Champions. The fight will air on ShowTime Championship Boxing. Their first encounter was a wild one with over 1000 punches thrown in the fight, with Santa Cruz winning by decision. The rematch should be just as exciting. ShowTime will be airing another fight brought by Premier Boxing Champions on April 7 2018 as well, and it will be a big one. 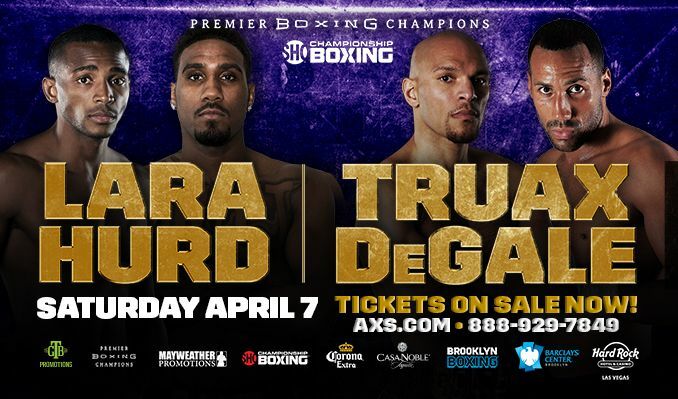 This fight will be a title unification bout between the WBA Junior Middleweight Champion Erislandy Lara (25-2-2, 14 KO’s) and the IBF Junior Middleweight Champion Jarrett “Swift” Hurd (21-0, 15 KO’s). A venue has not yet been chosen for this fight, but an announcement should be coming soon. 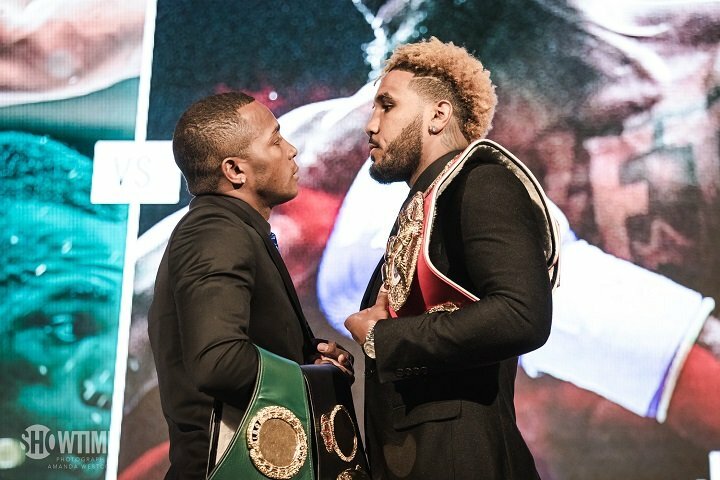 This fight will be a part of a sort of unofficial Junior Middleweight tournament, with the winner presumably taking on the current WBC Junior Middleweight champion Jermell Charlo. Hurd’s most recent ring appearance was a 10th round stoppage victory over former champion Austin Trout, that won him the vacant IBF title. Lara recently fought Terrell Gausha, and defeated him in a one sided decision victory. It was a bitter sweet moment this past Saturday night, when we watched a legend put the gloves on one las time. We expected a show, and Miguel Cotto (41-6, 33 KO’s) delivered. 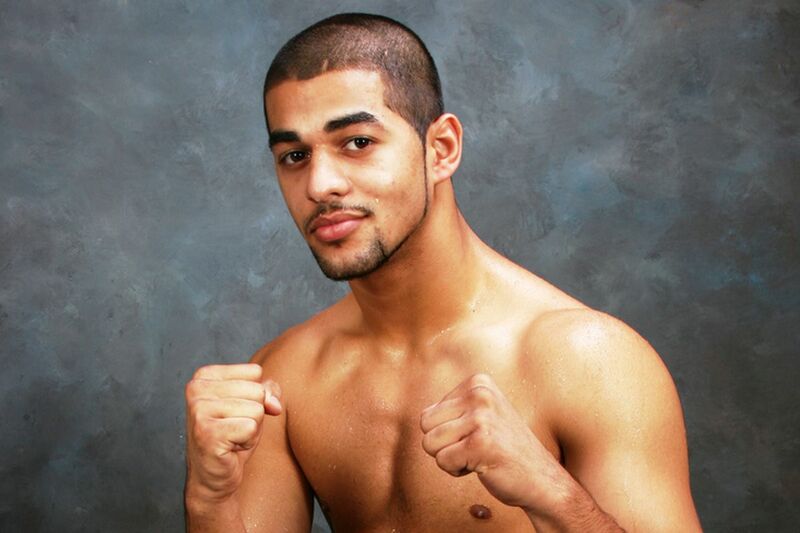 Sadly, he lost a 12 round unanimous decision to Sadam Ali (26-1, 14 KO’s), but he went out with a bang, and with class. Miguel reiterated that even with the loss in what was his final fight, he would not return to the ring, he would stay home and focus on his family. The sure fire hall of famer looked sad to leave the boxing world in his rear view mirror, but he said said over and over that now it is his turn to be there for his family, just as they have stuck by his side throughout his boxing career. After a feel out first round for both fighters, things started heating up in the second. Salam Ali hurt Cotto badly with a right hand and had him on wobbly legs. Later in the round Ali went down on what looked like a knockdown, but was in fact a slip. Cotto came back strong in the third, outlander Ali, but still looked a bit bothered by Ali’s hand speed. Back and forth they would go, as again in the 4th, Ali stunned Cotto with a huge left hook, and had him dazed momentarily. In the 6th, Cotto turned the tables with a huge right hand of his own, and had Ali trapped in the corner. Ali would escape the round with a brilliant left hook counter, that got Cotto out of his face. Cotto also had a huge 7th round, but in the 8th, things would start to turn in Ali’s favor. For some reason, Cotto stopped throwing in the 8th round. 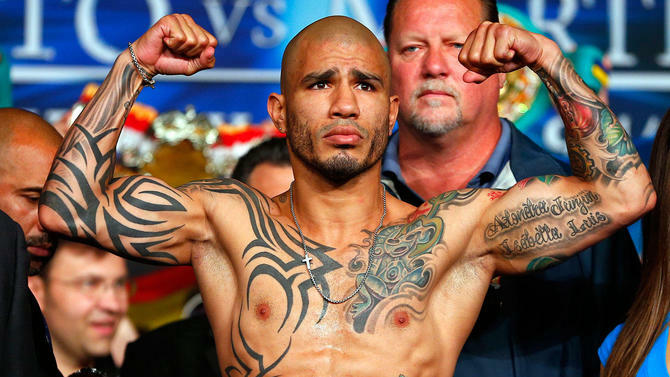 We would later learn that Cotto tore his left bicep, and it sure looked that way after the fight. The bicep curled up and looked ads if it was in the wrong place on his arm. Without the left arm at his disposal, Cotto lost his money much, which is his left hook. In the 10th, Ali hurt Cotto again with a big left hook, and Cotto spent the rest of the round running. Ali, perhaps feeling a sense of urgency in a close fight, came out guns blazing in the 11th, showing lightning quick combinations. In the final round of Cotto’s career, Ali’s speed would prove to be too much against the wounded veteran. The 12th round was a toss up, and if given to Cotto, the fight would have ended in a draw. Cotto did outland Ali in the final frame, but Ali landed the more meaningful punches, and just looked better in general. The final scores were as follows: Julie Lederman had it 115-113 (Ali), Eric Marlinski had it 116-112 (Ali), and Steve Weisfeld had it 115-113 (Ali). The final push stats read as follows: Cotto landed 163 of 536 (30%) while Ali landed 139 f 647 (21%). The difference in the fight was the power punches. Ali landed 122 of 373 (33%), while Cotto landed 108 of 322 (34%). Ali was the busier fighter and he got the nod. This could have easily been a draw, as the final round was a 50-50 call. Never the less, the legend went out with a bang, and we thank him for that. Salam Ali becomes the new WBO Junior Middleweight champion. Antonio Margarito #2 — Win, TKO 10th round (12), 12/3/11. Luis Abregu — Win, TKO 9th round (10), 11/8/14. Jessie Vargas — Loss, TKO 9th round (12), 3/5/16. Jorge Silva — Win, KO 3rd round (10), 1/28/17. Last Friday night, on Premier Boxing Champions On Spike, Erislandy “The Dream” Lara (24-2-2, 14 KO’s) successfully defended his WBA Junior Middleweight title, by knocking out Yuri Forman (34-3, 10 KO’s) in the 4th round. It was more of the same from Lara (one of the best technical fighters in the sport), as he just sat back and looked for counter opportunities, as he usually does. Lara is one of the best counter punchers in the sport, and he rarely moves forward and goes on the attack. Lara out boxed Foreman in all 4 rounds, and in the 3rd he got a knockdown on Foreman. The first knockdown should have been called a slip, because Foreman went down without getting hit by a punch. In the 4th round however, Foreman charged Lara, and Lara loaded up on a huge uppercut to put Foreman down again. Foreman would get up right before the count of 10, but with no legs underneath him, and a hazy look in his eyes, the referee stopped the fight. Lara is victorious via TKO, and retains his WBA Junior Middleweight title. In the co-featured bout, Anthony “The Dog” Dirrell (30-1-1, 24 KO’s) defeated Norbert Nemesapati via 6th round TKO. There isn’t much to say about this one, because it was basically just target practice for Dirrell through 6 rounds. Dirrell was loading up on every shot, just nailing Nemesapati in the head and body, but the youngster would not go down. Nemesapati showed tremendous guts and heart, trying his best and not giving up, but he was clearly overmatched against the hard punching Dirrell. After the 6th round, the fight was stopped in the corner, simply because of the accumulation of punishment to the head of Nemesapati. Anthony Dirrell gets the TKO victory, in hopes of one more title shot. Last night on ShowTime Championship Boxing, Abner Mares (30-2-1, 15 KO’s) defeated Jesus Cuellar (28-2, 21 KO’s), and captured the WBA Featherweight title. This was potentially Mares’ last opportunity to capture a title, and he delivered in exciting fashion. The first round was all fire works, as both men came out swinging for the fences, trying to dispense of the other man early. Cuellar got the best of Mares in the beginning of the fight, takin 3 of the first 4 rounds on my score card. Mares found the adjustment to Cuellar’s attack however, in the form of the straight right hand. Cuellar was trying to push the action after the 4th round, and every time he leaned in with the left hook, Mares would counter with the right. Mares had to calm down and not get into a brawl with Cuellar, who by nature is a brawler, and that it exactly what he did. Sharp counters from Mares slowed the pace a bit and gave the better boxer (Mares) the advantage. Mares’ punches were quicker and more accurate from the middle of the fight on, and totally took the bullying mentality away from Cuellar. In the 11th round, Mares was able to drop Cuellar to the Canvas, and if it was close on any scorecard, the knockdown put the fight out of reach for Cuellar. 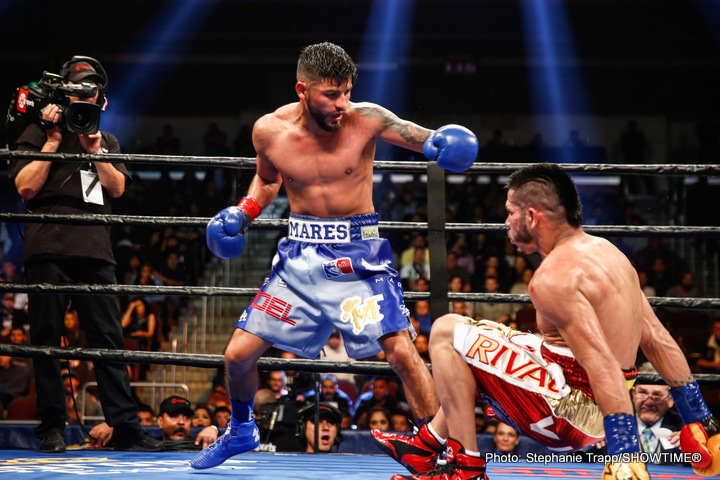 Im not quite sure how it ended in a split decision, because Mares definitively won the fight. Kermit Bayless scored the fight 115-112 for Cuellar (which was totally bogus), while Dave Moretti scored it 116-111 for Mares and Max Deluca scored it 117-110 for Mares. Also Jermall Charlo (25-0, 19 KO’s) defeated Jullian Williams (22-1-1, 14 KO’s) by 5th round KO. Charlo hit Williams with a vicious uppercut which put him down, and knocked him out with a hook later in the round to retain his IBF Junior Middleweight title.